Where were you at 7:49 a.m. Eastern Time on July 14, 2015? Three billion miles from Earth, NASA's New Horizons spacecraft, moving at speeds that would get it from New York to Los Angeles in about four minutes, was focused on Pluto and its moons – distant worlds that humankind had never seen up close – recording hundreds of pictures and other data that would forever change our view of the outer solar system. A year after the New Horizons mission made science and space exploration history – the exploration of Pluto completed the era of first reconnaissance of the planets begun by NASA in 1962 – the spacecraft is now nearly 300 million miles beyond Pluto, speeding toward its next target in the Kuiper Belt and not looking back. Watch the countdown on Earth as New Horizons – three billion miles from home – approaches Pluto and makes space science history. 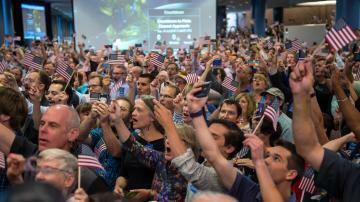 But on Earth, the excitement of July 14, 2015, remains fresh – from memories of the morning celebration a year ago marking the flyby moment at the Johns Hopkins University Applied Physics Laboratory in Maryland, to the tension and relief that evening when New Horizons signaled back to its mission control that it had successfully completed the flyby. "New Horizons not only completed the era of first reconnaissance of the planets, the mission has intrigued and inspired. Who knew that Pluto would have a heart?" said NASA's Director of Planetary Science Jim Green. "Even today, New Horizons captures our imagination, rekindles our curiosity, and reminds us of what's possible." "Our entire team is proud to have accomplished the first exploration of Pluto and the Kuiper Belt—something many of us had worked to achieve since the 1990s," said Alan Stern, New Horizons principal investigator from Southwest Research Institute in Boulder, Colorado. "The data that New Horizons sent back about Pluto and its system of moons has revolutionized planetary science and inspired people of all ages across the world about space exploration. It's been a real privilege to be able to do that, for which I'll be forever indebted to our team and our nation." Not designed to collect images and transmit data at the same time, New Horizons was out of contact with Earth during almost all of its closest approach day last July. But the mission team, joined by almost 2,000 guests at APL, and an international web and TV audience, marked the flyby with a countdown that rivaled New Year's Eve in Times Square. Network morning shows beamed live images of U.S. flags waving and people cheering around the room. Later that morning, the team revealed a stunning, iconic image of Pluto, the last photo New Horizons took and transmitted before entering flyby silence. 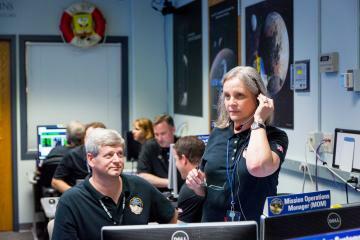 But the most critical transmission on July 14 was the burst of telemetry, set to arrive in mission control just before 9 p.m., indicating the spacecraft was healthy and did its job. The suspense was short-lived, as the transmission — sent from New Horizons more than four hours earlier — came right on time. The first close-up pictures showing Pluto's surface and some of its moons in incredible detail, arrived July 15. Over the next several days and months, the science team pored over data and images that revealed flowing nitrogen glaciers, mountain ranges as tall as the Rockies, detailed structure in Pluto's atmosphere, and a vast, craterless, heart-shaped plain and other features that are still geologically active today, four billion years after the system formed. New Horizons has now sent about 80 percent of the data stored on its recorders back to Earth; transmission of the remainder will be complete by October. To say that New Horizons shook the foundation of planetary science is an understatement – the discoveries already culled from the pictures and compositional and space environment readings have not only introduced us to the Pluto system, but hint at what awaits as scientists examine other worlds in the Kuiper Belt. New Horizons Principal Investigator Alan Stern rounds out the mission's most surprising and amazing findings from Pluto so far . . . The complexity of Pluto and its satellites is far beyond what we expected. The degree of current activity on Pluto's surface and the youth of some surfaces on Pluto are simply astounding. Pluto's atmospheric hazes and lower-than-predicted atmospheric escape rate upended all of the pre-flyby models. Charon's enormous equatorial extensional tectonic belt hints at the freezing of a former water ice ocean inside Charon in the distant past. Other evidence found by New Horizons indicates Pluto could well have an internal water-ice ocean today. All of Pluto's moons that can be age-dated by surface craters have the same, ancient age – adding weight to the theory that they were formed together in a single collision between Pluto and another planet in the Kuiper Belt long ago. Charon's dark, red polar cap is unprecedented in the solar system and may be the result of atmospheric gases that escaped Pluto and then accreted on Charon's surface. Pluto's vast 1,000-kilometer-wide heart-shaped nitrogen glacier (informally called Sputnik Planum) that New Horizons discovered is the largest known glacier in the solar system. Pluto's atmosphere is blue. Who knew? Pluto shows evidence of vast changes in atmospheric pressure and, possibly, past presence of running or standing liquid volatiles on its surface – something only seen elsewhere on Earth, Mars and Saturn's moon Titan in our solar system. The lack of additional Pluto satellites beyond what was discovered before New Horizons was unexpected. "It's strange to think that only a year ago, we still had no real idea of what the Pluto system was like," said Hal Weaver, New Horizons project scientist from the Applied Physics Laboratory. "But it didn't take long for us to realize Pluto was something special, and like nothing we ever could have expected. We've been astounded by the beauty and complexity of Pluto and its moons and we're excited about the discoveries still to come. We've really just scratched their icy surfaces, and I hope that someday we return to explore the system further." 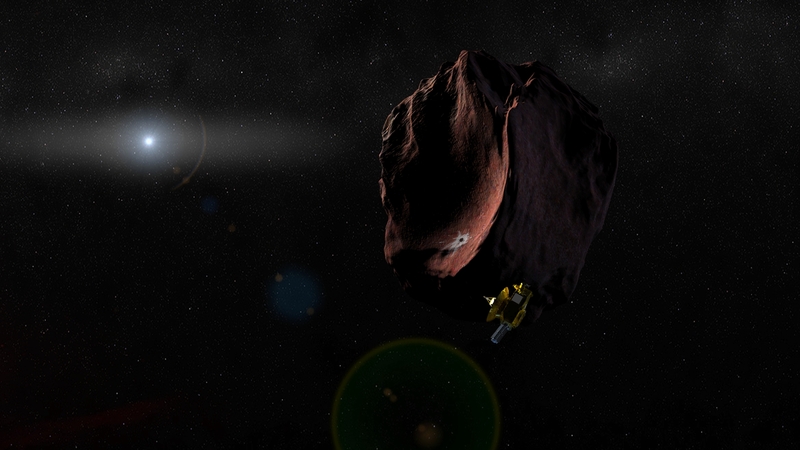 Artist's impression of the New Horizons spacecraft encountering a Kuiper Belt Object, as part of a potential extended mission after the Pluto flyby. In 2014, using the Hubble Space Telescope, New Horizons science team members discovered three KBOs – all in the range of 20-55 kilometers across, and all with possible flyby dates in late 2018 or in 2019 — a billion miles beyond Pluto. Any extended mission would require NASA approval. With Pluto way back in New Horizons’ rearview mirror, the team is already focused on the next challenge – a close flyby of 2014 MU69, an ancient Kuiper Belt object that is much smaller than Pluto but a billion miles farther out – on Jan. 1, 2019. NASA approved the extended mission on July 1. What's your favorite Pluto flyby moment? Share on Twitter – don’t forget to tag @NASANewHorizons at use #plutoflyby – or send a note to web-NewHorizonsWebmaster-contact@jhuapl.edu. 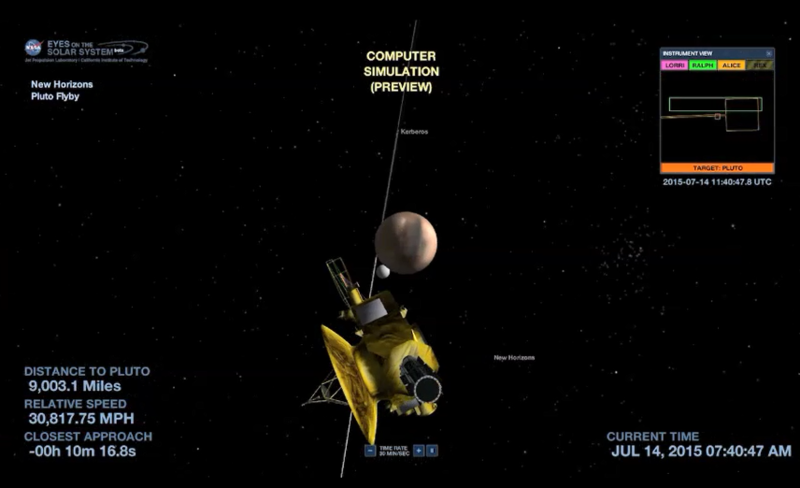 Watch as the mission operations team at the Johns Hopkins Applied Physics Lab receives the signal from New Horizons and confirms a successful flight through the Pluto system.